BALCONY SEATS: are on the first floor, are in theatre/cinema style rows and are unreserved. Please note: There is no disabled access to the balcony. Did you miss The Beatles first time around? - Don’t miss them now! With the songs that changed a generation, this show will have you tapping your feet from the opening bars of “Twist and Shout” to the haunting “Lucy in the Sky” you will be dancing in the aisles…..and screaming like you did in ’63! From the depths of Liverpool’s Cavern Club all the way up to that famous rooftop on The Apple Building, The Upbeat Beatles will take you on a journey that is the story of The Beatles through their songs. 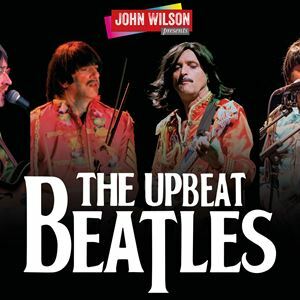 The Upbeat Beatles are four supremely talented guys. 13 guitars, 5 costume changes, great powerhouse vocals and close harmonies, teamed with a driving backbeat to give you a night you’ll never forget.